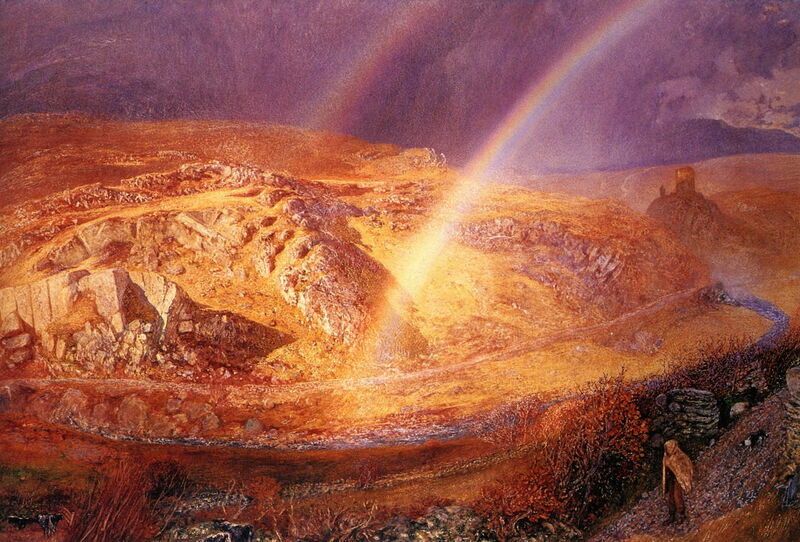 Alfred William Hunt (1830–1896), A November Rainbow - Dolwyddelan Valley, November 11, 1866, 1 p.m. (1866), watercolour, 49.5 x 74.9 cm, Ashmolean Museum, University of Oxford, Oxford. The Athenaeum. 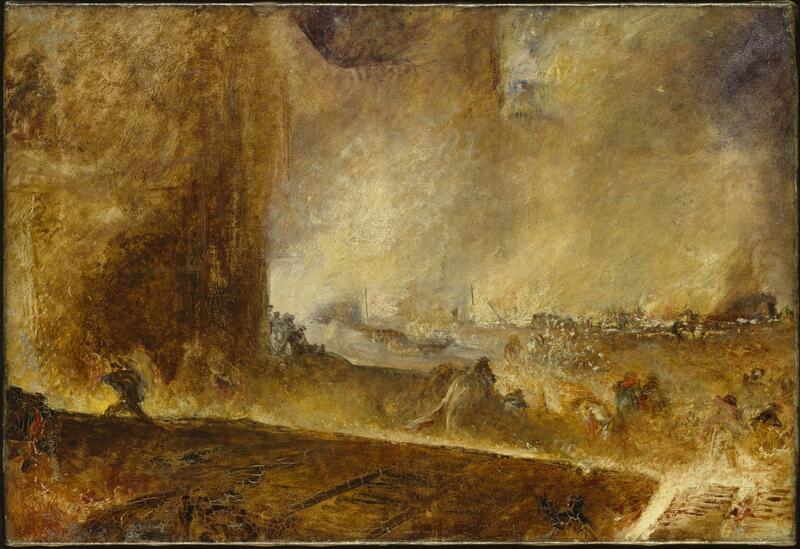 Following the death of JMW Turner in 1851, there did not appear to be any successor in British art. The Pre-Raphaelite Brotherhood had been formed, but was working in quite a different direction, and the focus of development in landscape painting had moved to Paris, and the Impressionists. 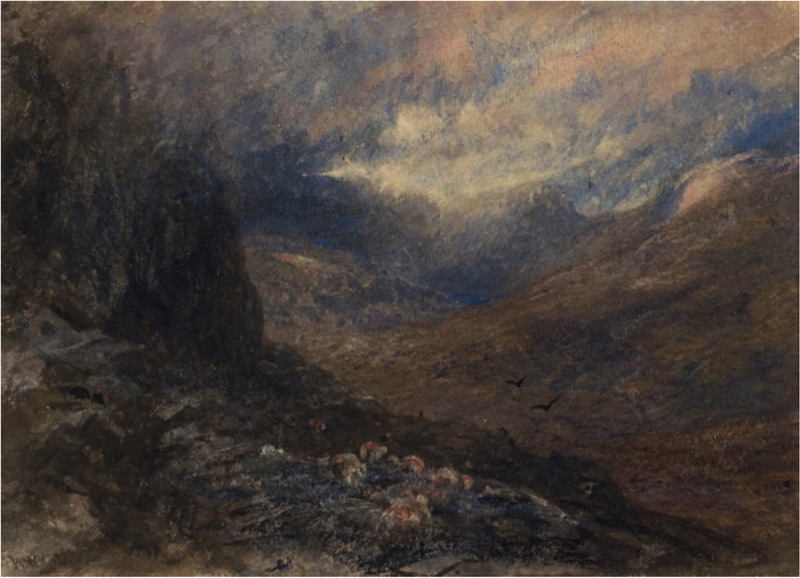 In fact there was one original landscape painter who continued to develop from Turner: Alfred William Hunt (1830–1896). Almost forgotten now, he painted some out the finest landscapes of the century, which even today can stand alongside modern paintings in terms of their use of light, colour, and his amazing control of detail. Hunt was born in Liverpool on 15 November 1830, the son of a landscape painter who ran a drawing academy. A bright child with precocious ability in drawing and painting, he entered Oxford University in 1848, won the prestigious Newdigate Prize for poetry, and graduated in 1852. 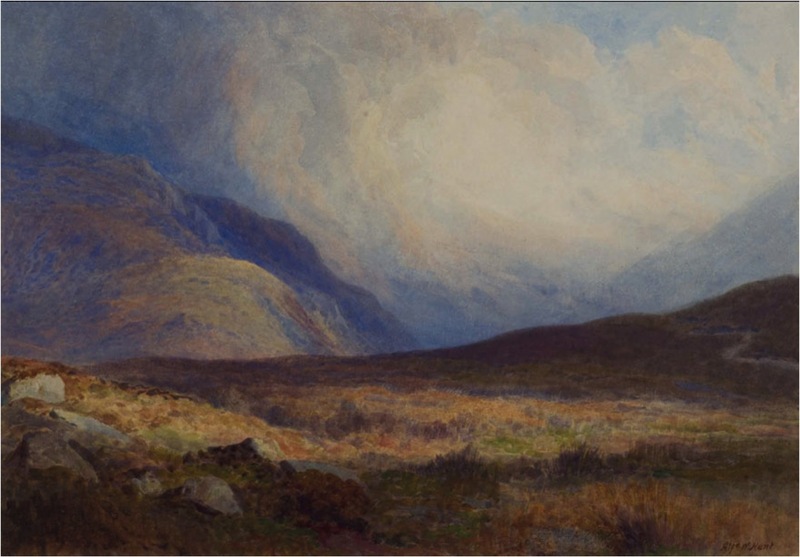 He had already started showing his paintings at the Liverpool Academy, including views of the Lake District such as that below. 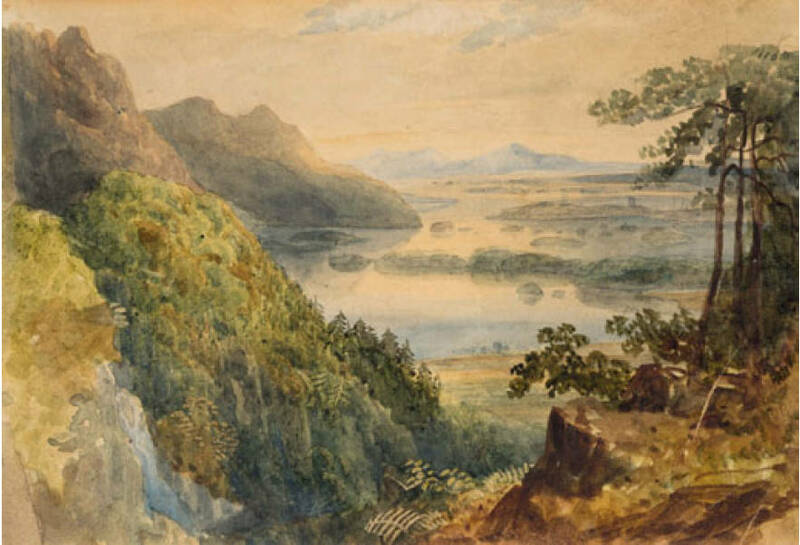 A Lake District Scene (late 1840s) is an early and truly picturesque watercolour painting of a view which has not been identified, but is set in the Lake District of Cumbria, in the north-west of England. Hunt toured Europe in 1850, and his sketches survive. During the 1850s, Hunt was commissioned by Oxford picture dealer and print-seller James Wyatt to paint on trips to North Wales, providing views for sale in Wyatt’s shop. 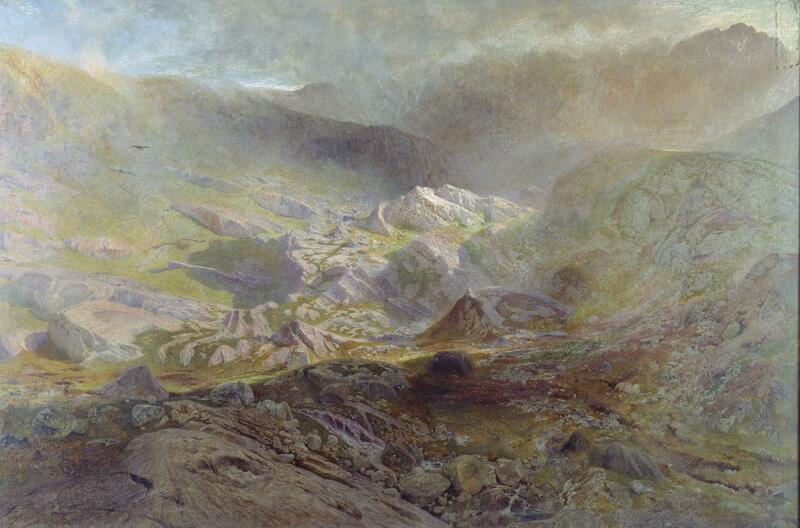 In 1856, Hunt had a landscape painting of North Wales, now sadly lost, accepted for exhibition at the Royal Academy, and to his delight it was praised by the most influential critic of the day, John Ruskin. Glen Nevis, Scotland (c 1857) shows a very atmospheric view of the valley running to the south of Ben Nevis, Scotland’s highest mountain, complete with sporadic sheep. Cwm Trefaen (1857-8) was probably based on sketches and watercolour studies made during Hunt’s visit to the area in 1856. It shows the north-eastern flank of Glyder Fach (the ridge in the distance), a well-known peak in North Wales, with its rugged, glaciated landscape. 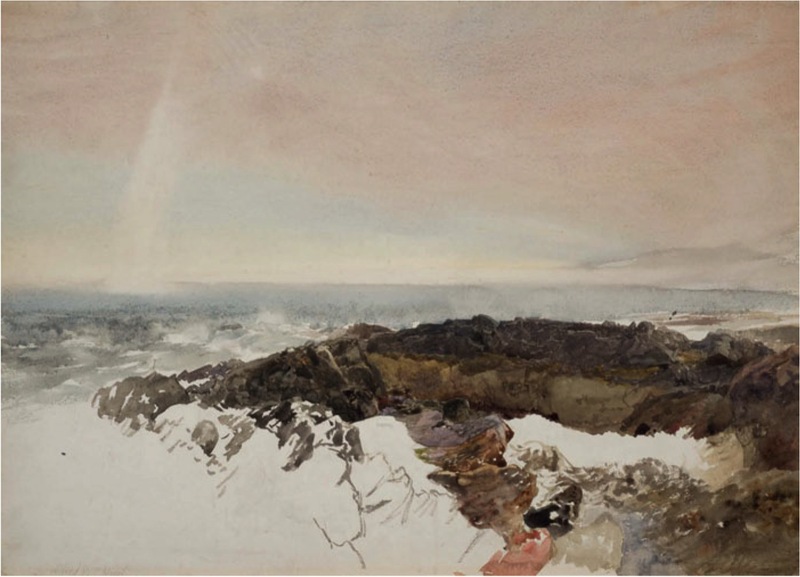 Submitted unsuccessfully to the Royal Academy in 1858, criticism from John Ruskin led Hunt to rework some of its rock passages, and it was not exhibited until 1859, and then in the Hogarth Club (formed to support the work of progressive artists), not the Royal Academy. 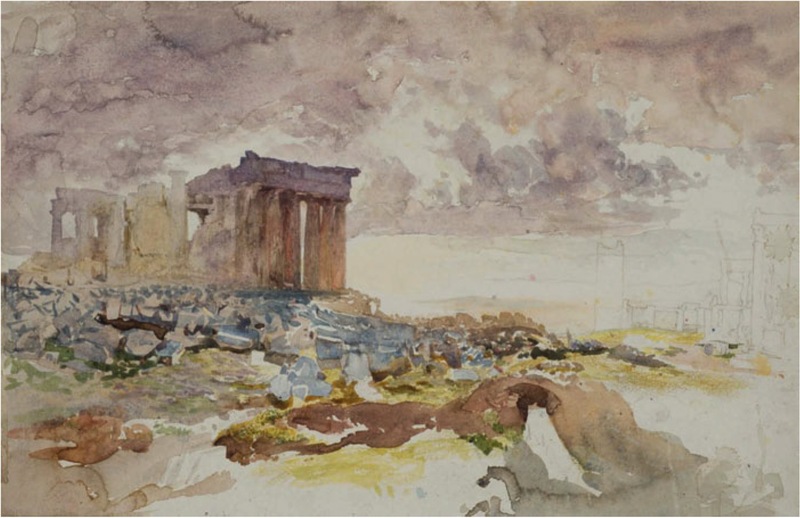 Hunt was elected a Fellow of his old Oxford college, Corpus Christi, at the end of 1857, and started to divide his time between home in Liverpool, teaching in Oxford, and painting trips. Cochem on the Moselle (c 1859) shows the tiny town and its dominating ruins of the Reichsburg castle, which was destroyed by French forces in 1689. Hunt visited the town during the summers of 1859 and 1860, when taking his fiancée to a famous optician near Düsseldorf in Germany. 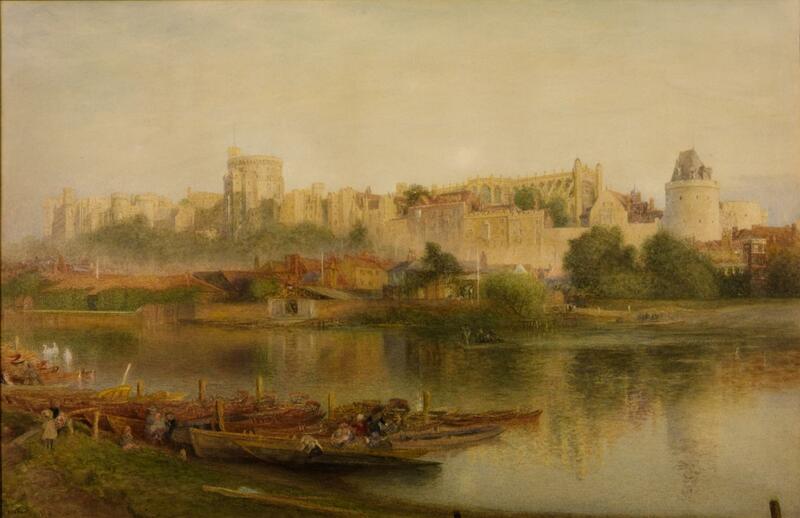 The couple eventually married – Hunt having to resign his Oxford fellowship beforehand – in late 1861, and moved to Durham, where he painted some of the most magnificent views of Durham’s spectacular castle and cathedral. 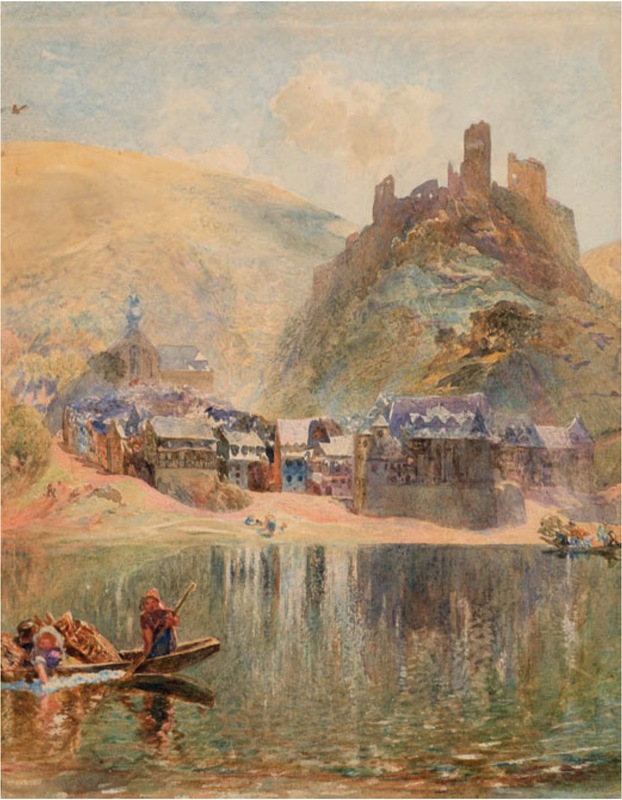 Alfred William Hunt (1830–1896), Finchale Priory (1861), watercolour and bodycolour with scratching out, 52.2 x 48 cm, Private collection. Wikimedia Commons. Finchale Priory (1861) shows this late twelfth century priory church and monastery, which are north of Durham, in north-east England. 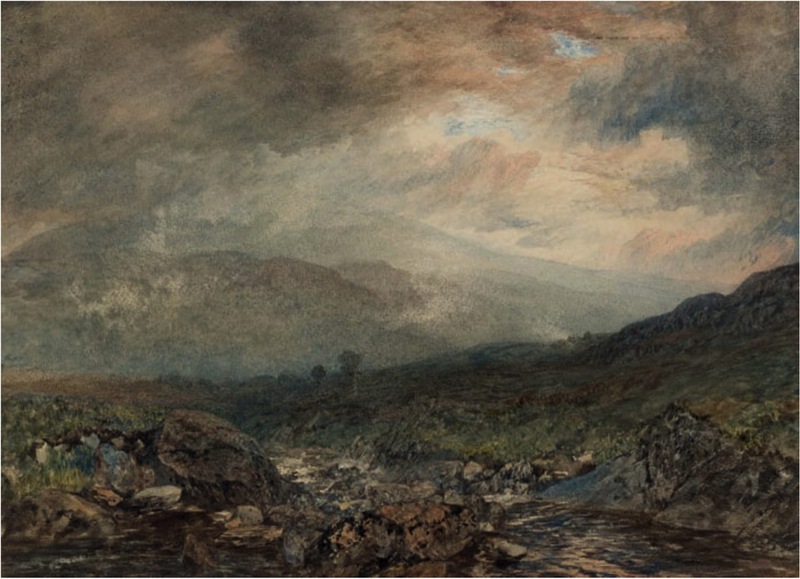 John Ruskin appears to have been particularly critical of the sky in an oil version which is presumed to have been lost. 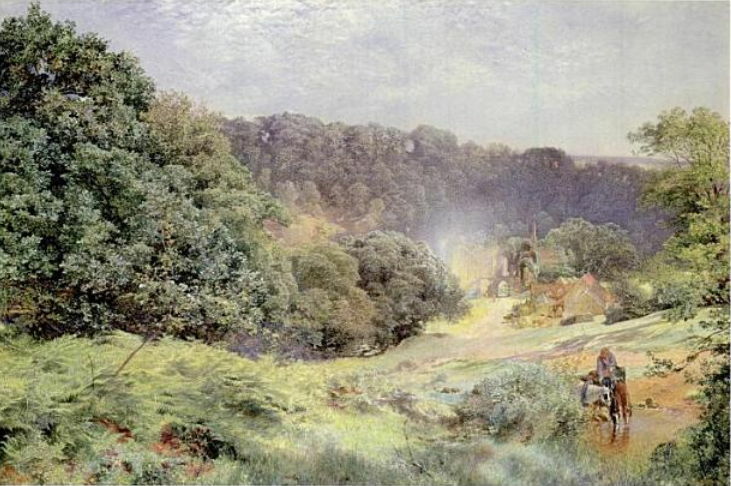 The Greta at Rokeby (1863) shows a wooded section of the River Greta, at one of Hunt’s favourite locations near Rokeby in North Yorkshire, England. 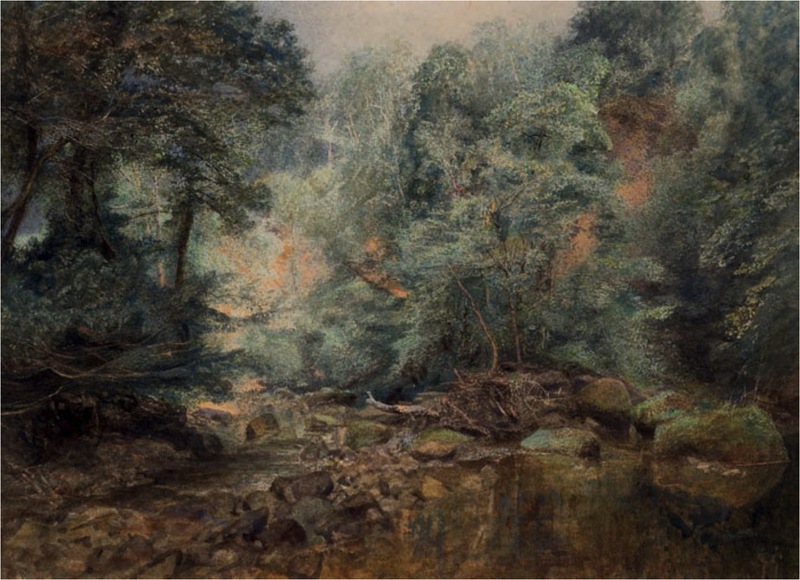 The River Greta had long been a favourite with painters, and its lower stretches were featured in watercolours by John Sell Cotman, among others. Iron Works, Middlesborough (c 1863) shows an interior view of a foundry. Running across the foreground is a channel of molten iron, which fills moulds for blocks of pig iron. 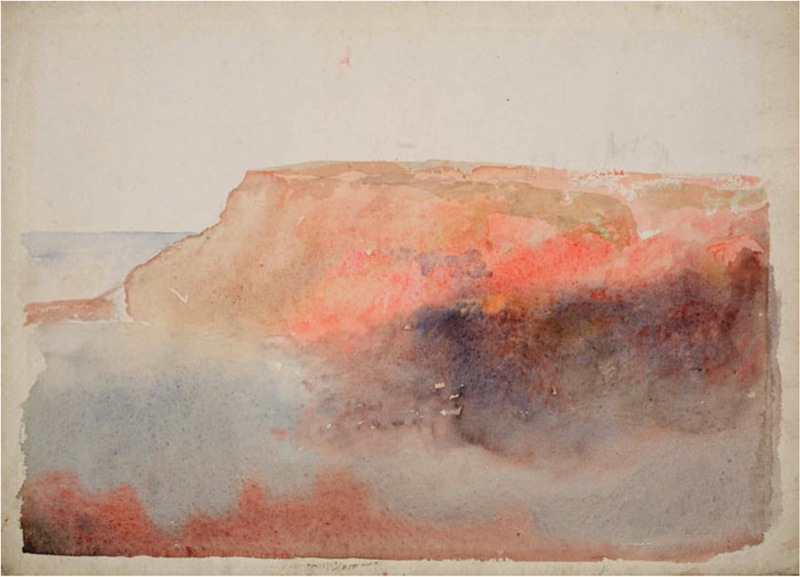 Although critic John Ruskin was impressed, the painting did not apparently sell. From 1863, Hunt failed to get any paintings accepted for exhibition at the Royal Academy. He and his family moved to London in 1865, where he set up a studio. He continued to tour Britain during the summer and autumn, and travelled further afield too: to the Mediterranean (1869-70), Norway (1877), and several tours of the west coast of Scotland in the 1870s. When all the glens are drown’d in azure gloom. 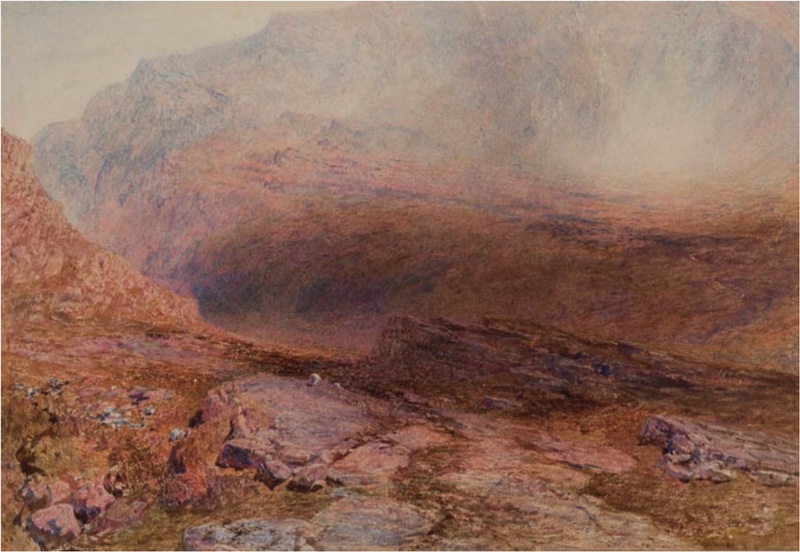 Alfred William Hunt (1830–1896), Bay of Naples – A Land of Smouldering Fire (1871), watercolor with touches of gouache over graphite on paper, 49.5 x 75.3 cm, The Metropolitan Museum of Art (Purchase, Florence B. Selden Bequest, 2000), New York, NY. Courtesy of the Metropolitan Museum. 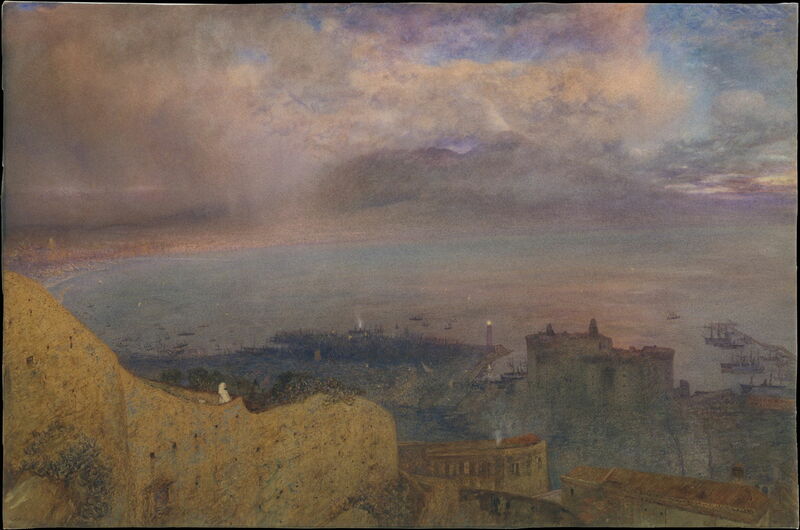 Bay of Naples – A Land of Smouldering Fire (1871) was probably based on sketches and studies made during Hunt’s tour of the Mediterranean during the winter of 1869-70. This view is taken from the top of the Vómero, a hill to the west of the mediaeval city of Naples. In the left foreground is a wall from the fortifications. In the far distance, across the bay, is Vesuvius, still partially lit by the rays of the setting sun. Hunt stood unsuccessfully for membership of the Royal Academy in 1884, and again in 1886. The Fine Art Society did, though, host a major retrospective exhibition of 137 of his paintings, both oils and watercolours, in 1884. During the 1880s, he started to feel his advancing years, and cut back on his outdoor painting to help him cope. Despite that, he undertook the next painting in conditions which far younger people would find daunting. 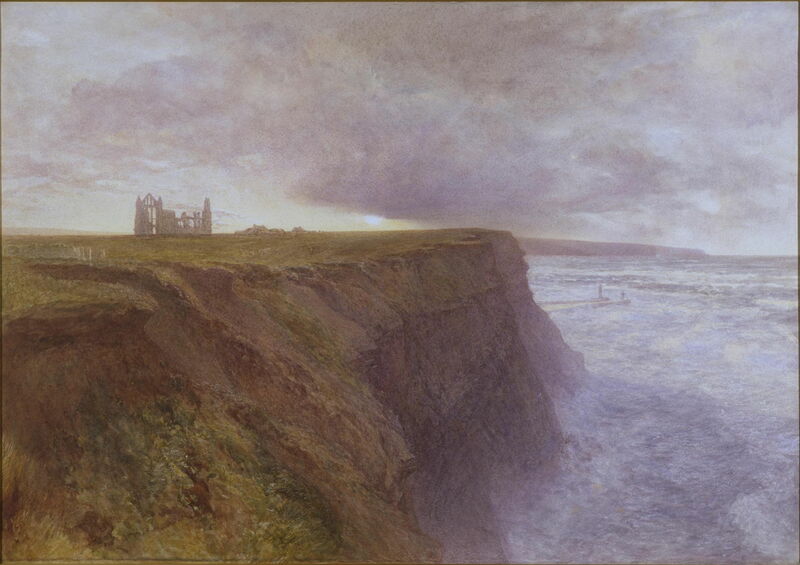 Alfred William Hunt (1830–1896), Wind of the Eastern Sea: View of Whitby Abbey (c 1888), watercolour, 53.7 x 76.8 cm, The Victoria and Albert Museum, London. Image courtesy of and © Victoria and Albert Museum, London. Windsor Castle (1889) shows the royal residence from the Eton side of the River Thames, a stretch known as the ‘Brocas’. Painted during the summer of 1889, Hunt visited on day trips by train from London, so that he could remain based at home. Ffynnon Llugwy, Penyrhelgi Summit, Wales (date not known) shows the lake in the Carneddau Mountains, near Snowdon, in North Wales. Mountain Landscape (date not known) shows a location which has not been identified. Rocky Hillside Near Flamborough Head, Yorkshire was unfinished at the time of Hunt’s death. A Stream in Moorland Landscape (date not known) is also of an unknown location, probably in North Wales. Whitby (date not known) appears to have been one of the many colour studies which Hunt made throughout his career. He visited the USA in 1893, to see a display of his paintings which was mounted in Chicago. In the spring of 1896, he suffered an acute lung illness, then described as bronchitis, and died on 3 May. The following year there were two exhibitions of his work, and in 1897-8 the Walker Art Gallery in his native Liverpool held the largest exhibition, of 205 works, including 31 oil paintings. The next exhibition devoted to his paintings was not until 2004-5, and was held at the Yale Center for British Art, New Haven, and the Ashmolean Museum, Oxford. No catalogue raisonné has been published. Wikipedia – a mere stub. Newall C (2004) The Poetry of Truth. Alfred William Hunt and the Art of Landscape, Ashmolean Museum. ISBN 978 1 854 44196 6. Hunt’s paintings are not uncommon in the stock of many specialist British art dealers, but those who regularly carry a stock include Chris Beetles Gallery and The Maas Gallery. As he is not yet particularly popular, prices are still modest. But for how much longer? Posted in General, Painting and tagged Hunt, landscape, painting, Pre-Raphaelite, Ruskin, Turner, watercolour. Bookmark the permalink. The best man won Electric Light Company, Hunt is good though.